Owner, Tony, has a raw passion and talent for hair that cannot be learned, it can only be experienced. It’s not uncommon for people to pull up a chair and watch him cut hair as if it were a spectator sport. 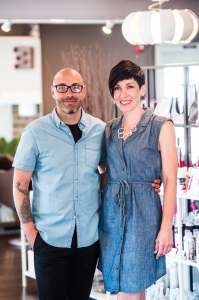 When combined with a genuine love for his clients and the desire to teach and train other stylists, the dream to own his own salon became a reality in 2013 when Love Salon opened its doors. He and his wife Sara, decided to take their future into their own hands with 4 small children they knew this was their moment to reach out and grab an amazing opportunity. Tony, a very successful hairstylist for 15 years prior in Philadelphia, had built a huge following and an extremely advanced method of cutting hair. With Sara’s support running the daily grind behind the scenes they make a great team. Opening a business of any kind takes hard work, focus and determination. Remembering your “why” every day is very important – all of the reasons “why” you chose to take that leap of faith – thank you to all of our amazing friends and family who have supported us in our journey so far. We are just getting started! Love Salon exists to be a force in the salon scene – we love to shake things up and do it differently than it’s been done before. We decided on the name “Love Salon” because that is how we choose to operate our business and our lives. Whether it is a client, fellow stylist or complete stranger our mission is to show love. Love is about each one of us giving of ourselves to serve others, with no expectation of anything in return. This business model has proven itself over and over again as we consistently hear from our clients that they leave feeling not only beautiful but recharged as well. Our amazing team of stylists also strive to give of themselves on a daily basis leading to awesome friendships and successful careers. Love is a force that makes the world go round. We are always ahead of tomorrows trends, that’s what it takes to be successful in this industry. Education and inspiration are the keys to moving forward and never losing that spark of creativity. We are constantly learning both inside and outside of the salon focusing not only the craft of hair dressing but also the art of building relationships, loyal clientele and finding success in this amazing career. Our team of stylists boast several unique credentials including Wella Master Colorist Expert and Sebastian Design Team Educator. We work closely with our product companies such as Wella, Tru Beauty and Art of Business to provide top notch training for our stylists on a consistent basis. We also take newly licensed beauty school graduates and lead them through a rigorous hands on apprentice program allowing them to blossom into the highest levels of success in this industry.